"Beneath us lie the God Wars Caverns. There, the generals of the gods continue the battle that was started thousands of years ago, oblivious to the passing of time." Kree'arra is one of Armadyl's strongest warriors. At a combat level of 580, this large Aviansie is amongst the strongest monsters Gielinor has to offer. This monster is responsible for innumerable deaths, but if done properly; offers some of the best money making methods per hour, as well as over 250k Ranged and 120k Slayer experience per hour when on an Aviansies task. Prayer boosting gear: The Penance Aura, the Reverence Aura, the Holy Wrench, and the Shield from the Falador tasks all help ensure the trip isn't too intense on your Super Restore potions. Spring Cleaner (Filled with springs): This item converts certain drops to their base materials, or bonus xp. It's extremely useful for those who don't have a Pack Yak or can't afford Magic Notepaper. Some progress at the Dominion Tower: This unlocks a dominion marker (as well as dreadnips) The marker saves you space in the form of potions; it applies constant boosts to all your combat stats. The boost depends on your progress within the Dominion Tower. Having 60 prayer helps for the Split Dragontooth necklace, which when coupled with a bone crusher restores prayer points. (Read below) However, having 95 prayer is highly recommended, for the use of the Soul Split and Anguish Curses. Note: Note: The Bonecrusher and one of the 3 Dungeoneering Prayer necklaces (Twisted Skull, Split Dragontooth, or Demonhorn) work very well at Armadyl. After you kill Kree'arra and his minions, they will all drop bones. The Bonecrusher automatically buries these bones, but here's the catch- the Necklace you're wearing gives your prayer points for each bone you bury- 50 per regular bone, and 100 per Big bone. This means after killing Kree and his minions, you get 250 prayer points back! Ranged is by far the most preferred attack style. Using at least tier 70 gear means the player will only take moderate amounts of damage at higher defence levels. However, Flight Kilisa, one of the minions in the room, uses melee and thus hits very accurately, albeit for small increments of damage. Armour: Anything above full Armadyl should suffice with 80+ defence and ranged. Karil's set is a cheaper alternative, but should you happen to die, you will lose a fair bit of cash repairing the pieces. 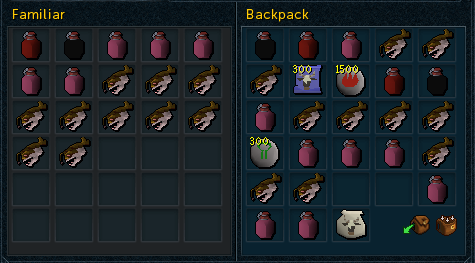 Use a Full Slayer Helmet if you have an Aviansies task. Note: Use a TokHaar-Kal-Xil if you use a Crystal Bow or a Zaryte Bow, as none of these weapons use actual ammunition, and Ava's devices lose their main purpose. Players will often find themselves bringing multiple auras as trips can last very long at Kree'arra if the correct strategies are deployed. Pocket slot: Shard of Zaros > Sign of Death > Sign of Life > Sign of Item Protection OR Scrimshaw of Cruelty > Scrimshaw of Ranging. 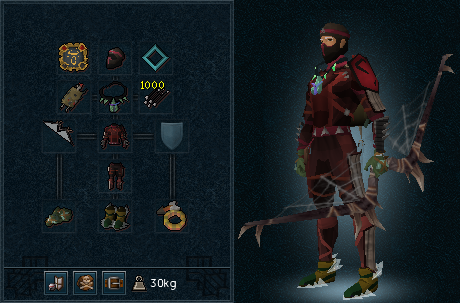 Note: Using a Pernix/Torva/Virtus item, or a Zaryte bow gives you protection against all factions of the God Wars Dungeon. Otherwise, bring a Shard of Zaros, or an Armadyl and Zamorak item. Weapons: Atleast a Royal Crossbow is recommended (tier 80 and up). Note: Bringing expensive amulets such as the Amulet of Fury is not recommended, as it merely adds to the losses upon death. A Dragonrider Amulet (reward from the One of A Kind grandmaster quest) has comparable stats and can be reclaimed for 500,000 GP from Mr. Mordaut the Dragon, who resides under the stairs of Varrock Museum. Note: Again, try to minimize how much you stand to risk upon death; bringing expensive amulets, necklaces will only make you lament more when you die. Note: If you choose to use a Unicorn, be watchful of your health; try to rely as much as possible on your familiar, and avoid using food unless your health drops below 3-4,000. Also, if you can't use a Pack Yak, bring an Explorer's Ring 4 or runes to cast the High Alchemy spell. If you're looking for a few fast kills, bring a Steel Titan and a few hundred scrolls. If you have 90+ range, 90+ defence, and 70+ gear, prioritize prayer over food. The minions will drop Manta Rays and Mushroom Potatoes periodically. Always keep one space open! You should be killing Aviansies for your killcount. These routinely drop adamant bars, which really add up over a series of kills. Depending on your luck, you should expect to get around 30-40 bars from your 40 killcount. Fill the rest of your inventory and BoB with food, otherwise bring Unicorn or Titan scrolls. Guthix's Balance: This Ultimate ability heals you 40% of your total health. Frequent use of this ability can prolong trips drastically. Please note, the butterfly can be killed by Kree and his minions; if you need to heal during a kill, use the Ice Asylum ability, although this limits your movement and only heals you 35% of your total health. Debilitate: While Kree'arra doesn't deal particularly high damage at any point of the fight, using this Threshold ability does help, especially for beginners and lower levelled players; as such, experienced players won't find this ability worth the while. Sacrifice: This Basic ability can potentially heal you over 2,000 life points, if you have Death's Swiftness activated, and use it on a minion who is close to dying. Devotion/Surge/Anticipate/Freedom: These abilities can help to stall your adrenaline between kills, leading to faster kills in general as you won't have to build up your adrenaline as much. Stalling is basically using an ability once every 12 seconds to prevent your adrenaline from dropping. Although not an ability, using the Enhanced Excalibur's special ability will heal you either 2,000 or 4,000 life points every 5 minutes depending on your progress in the Seer's Village Achievement Diary. This doesn't use any adrenaline. If you put the Sword on a key bind, quickly double tapping the key bind will cause you to automatically use the special ability of the sword, without the need to right click and "operate." An example of a suitable action bar would be: Piercing Shot, Sacrifice, Dazing Shot/Needle Strike, Ricochet, Fragmentation Shot, Snap Shot, Rapid Fire, Bombardment, Death's Swiftness. Feel free to add food, potions, Debilitate, Guthix's Blessing, the Enhanced Excalibur, or anything you feel might help you. It's highly recommended to NOT use the Shadow Tendrils ability, as it may result in your death if timed incorrectly. Using the Ricochet and Bombardment abilities as often as possible results in higher chances of killing the Magic and Melee minion twice per kill. This leads to more profit per hour. If your Prayer is under 92, you'd want to set your quick prayers to Prot. Item and Protect Range, as well as a Zealot boosted 'Overpowering Force'; if your prayer is between 92 and 95, you want to use Protect Item and Soul Split, and if it's above 95, you want Prot Item, Soul Split and Turmoil. 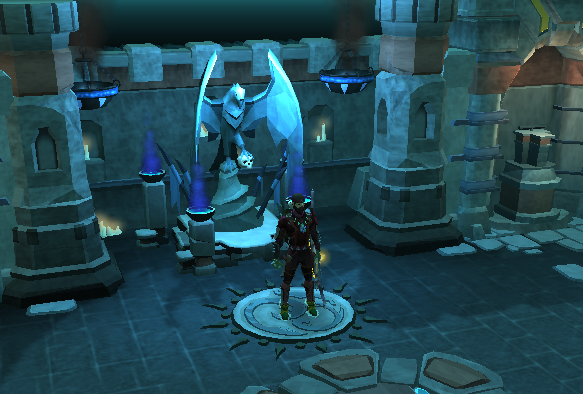 To bypass the 300 second cool down of Guthix' Blessing, you can hop to the lobby and log back on; doing so will take your adrenaline back to zero, but you won't have to wait 5 minutes to use the ability. It also resets all your abilities on cool down. 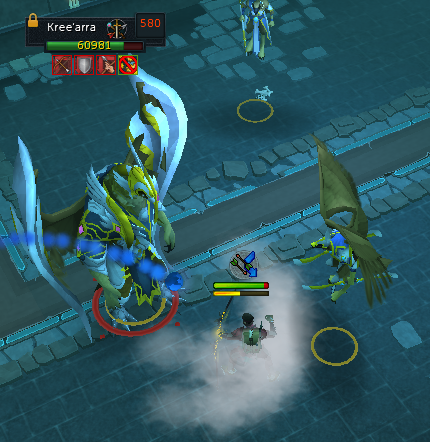 Kree'arra's attacks can push the player back. This poses a significant problem; if someone were to activate the "Rapid Fire" ability and Kree'arra pushes the player back, the ability is instantly cancelled. To counter this, stand next to the door, or in one of the corners (shown in the first picture below). The best place to stand in the room is the North West corner > North East Corner > Door. This is because while standing in the NW corner, the magic and melee minions take a longer time to wander over, resulting in less damage taken. 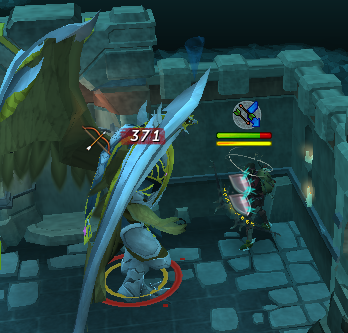 Kree'arra also has a melee attack that can hit upwards of 3000 damage! Thankfully for the player, this is only used if no one in the room attacks K'ree for some period of time. K'ree then walks to the player he's attacking, and starts attacking with highly accurate melee attacks. You have two strategies here; one is to avoid this scenario entirely by attacking K'ree as soon as he spawns. The other option is to capitalize on K'ree's movement, and use the Fragmentation Shot when he's walking, and just before he's about to melee you, activate the Death's Swiftness ability, which causes constant amounts of damage to be dealt to K'ree, as well as providing you with a substantial accuracy and damage boost. After killing Kree'arra, proceed to attack Flight Kilisa, the melee minion (who will be dealing more damage to you than his level 580 general, believe it or not) and then Flockleader Geerin, and finally Wingman Skree. This is because Melee is the most accurate style against you, Magic usually hits the highest, and Range barely scratches you. Kree'arra will always drop Big bones and a random amount of feathers. Uncommon drops include rune items such as crossbows, longswords, bolts, arrows, as well as Dwarf weed herbs and seeds. The majority of profit, however, comes from Kree'arra's unique drops. These include the Armadyl and Warpriest armour sets, 3 new abilities, as well as parts of the elusive Godsword- a weapon forged during the God Wars. Legend says its blade has the power to kill a God. The Warpriest of Armadyl set has a special effect that will decrease the cooldown of your abilities by 15%, occurring more often if you wear more parts of the armour set. Warpriest is one of the few hybrid armour sets in the game, meaning that you can use any combat style while wearing it without suffering any accuracy penalties. This is very handy at certain bosses like the Dagannoth Kings. Warpriest is dropped randomly, and can even be dropped by the Aviansies and other minions you must kill while getting your killcount; however the drop rate is much higher if you have participated in the 2nd World Event, where Armadyl, God of Justice, defeated Bandos, the God of War by crushing his head with his own mace. Kree'arra drops 3 abilities. These will not appear as drops, but instead you will get a message in your chatbox saying "You have learnt the _____ ability!" Like the Warpriest armour set, the abilities are learnt randomly, but the drop rate is higher for people who participated in the 2nd World Event. Transfigure: An ultimate ability which binds the player for 6 seconds, and the player heals 250% of any damage taken during the stun. This is considered by many to be dead content, although it might be helpful depending on the situation. Sacrifice: Sacrifice is a basic ability that heals 25% of the damage the player deals with it, or 100% if the attack kills the target. This is very handy when used in conjunction with Berserk on a slayer task- it's easily possible to heal over 3,000 life points with the right setup. Devotion: Arguably the most useful one of all 3, this threshold ability causes Protection Prayers and Deflect Curses to completely block all incoming damage to you for 10 seconds. In PvP, the ability blocks 75% of all damage. This could easily make the difference between life and death in several places. Kree'arra also drops parts of the Godsword. His minions drop Godsword shards (3 in total form a Godsword blade.) and he drops the much more coveted Armadyl hilt. Attach it to a god sword blade and you'll get an Armadyl Godsword! 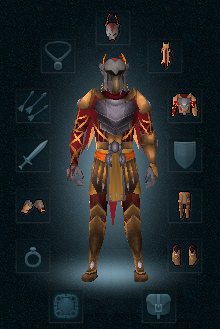 The Armadyl armour set is a Tier 70 range power gear. If you wield the whole set, you deal extra damage equal to 10% of a level 70 weapon. Drops include the Armadyl Chestplate, Chainskirt, Helmet, gloves, boots and buckler. Note: A lot of people get very, very annoyed upon getting an Armadyl buckler drop. Speaking as a PvMer who's had long streaks of bad luck, every drop is precious, and shouldn't be so callously disregarded. Instead of ranting about getting a useless drop, it's better to quietly acknowledge that you could have gotten mind runes instead of a buckler. Better luck next time! Frankly, the world has bigger problems, with Sliske starting an all-out war between the Gods, and Dragonkin threatening to destroy whatever survives their battles.